This Moses Ezekiel Statue of a Confederate soldier stands on Johnson’s Island in Sandusky Bay, Ohio, the site of a prisoner of war camp for captured officers, suspected disloyal citizens from several Border States and Confederate recruiters primarily from Kentucky. Following the Confederate surrender at Vicksburg and defeat at Gettysburg in July, 1863, the camp held more than 2,000 prisoners. Behind the statue is a national cemetery for about 260 of those prisoners who died on the island during the Civil War. How and why did that statue end up in a location far closer to Canada, in a Union State that sent five of its veterans to the White House end up by a national cemetery? The United Daughters of the Confederacy in Cincinatti led the drive in the early 1900s to commission the famous sculptor living in Rome for the work. 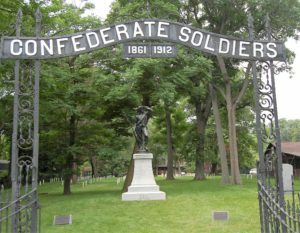 In light of the massacre of African-American attendees at a Charleston, South Carolina, prayer service, and the street violence in Charlottesville, Virginia, that surrounded a white supremacist, neo-Nazi march there the question is: Is it now possible to understand “this divisive strand of memory” — like the monument to Confederate soldiers at the historic Mathews County, Virginia, courthouse, or the Robert E. Lee Memorial on Monument Avenue in Virginia’s capital? Prominent icons in very public spaces. Speaking Saturday, July 28, in a conference at James Madison University in Harrisonburg Virginia on Confederate symbols — from battle flags to statues and monuments to kitsch like the Robert E. Lee car in the “Dukes of Hazzard” — were, from the left, Christy Coleman, chief executive office of the American Civil War Museum in Richmond and who headed the commission on the future of the city’s Monument Avenue; John Coski, historian at the Museum of the Confederacy and an expert on Confederate flags and imagery; James “Bud” Robertson, author of more than 40 books on the Civil War including the award-winning “Stonewall Jackson: The Man, The Soldier, The Legend,”; and Caroline Janney, director of the Nau Center for Civil War History at the University of Virginia and the author of two works on how that past was remembered by those who fought the war and their children. The Shenandoah Valley Battlefields Foundation sponsored the conference, which was carried by C-Span’s American History Channel and is archived. Following the Civil War, Ezekiel first seriously studied art in the Ohio River city. Born in Richmond, he also was the first Jewish student at the Virginia Military Institute and a survivor of the Battle of New Market in May 1864. One of his closest friends at VMI died in his arms after being taken when seriously wounded from the Shenandoah battlefield to a make-shift aid station. previous post: Where’s Deep Dish? Where’s Gino’s on Rush [Closed for Years]?